Dead and Dying retail: Help Dead and Dying retail Expand! Help Dead and Dying retail Expand! 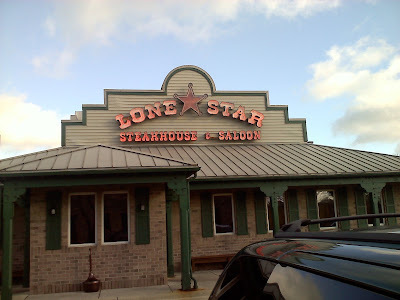 The Lone Star Steakhouse in North Olmsted, Ohio as of 11-23-11 It is one of Northeastern Ohio's few remaining locations, a Review on this restaurant is coming soon! With this site I want to have posts up from all across the U.S or even other countries. I need help since I am limited on travel. If anyone sends in pictures from any retail store anywhere and the location of those pictures I can put them up in a post, Just include your name and the location of the store So I can properly credit you as the person who took the picture and I can find out further information about the store. I want to limit this site to stores or restaurant chains that are shuttered completely or seem likely to close. I am really looking for photos of these retailers; Circuit City, Ames, Value City, Steve and Barry's, Sears, Kmart, Kmart Supercenter, Tops Friendly Markets, Office Depot, Bradlees, Roses, Caldor, Clarkins, DIY Home Improvement store, Builder's Square, Harbor Frieght Tools, AJ Wright, Biggs Hypermarket, Fisher's Big Wheel, Rink's Bargain City, Belk, Penn Traffic, Pathmark, A&P, Acme, Big Lots, Big Bear, Gold Circle, Zayre, and Ontario's. I am also looking for Dead and Dying mall pictures. Some restaurant photos I am looking for are; Chi-Chi's, Rax, Ground Round, Cooker Bar & Grille, Pufferbellies, Smokey Bones, Sandy's, G.D. Ritzy's, Lone Star Steakhouse, Frostop Drive-in, A&W Root Beer Drive-in, Spaghetti Warehouse, Sedona Grill, Tumbleweed, and Sizzler. Also I will put up any posts people send in. To put up your own post or pictures Email them along with your first and last name as well as the store location (if you have a list do not include a location) to niceckhart14@gmail.com. Also include the address of the store your post is on (not your address) my one experiment will be putting up a map of posts and store locators (does anyone Know how to do this?). I will edit the posts to get rid of spelling errors and make sure curse words are not used. I will properly credit any posts or photos as being from the Sender. I will try to have any pictures and posts sent in up as soon as possible. Pictures, Posts, and Comments are appreciated a lot here. Thank you for your patience. do you accept ponderosa steakhouse pictures? I have been to each and every mall in Illinois; each is active, dead, or SUPER DEAD! Should I send ALL these pictures, theirs a lot! Sorry for the delayed response. We (me and Mike) have decided to mainly focus on larger dead retailers and places such as dead or dying malls instead of the smaller places like on some of the older posts. Our newer posts have at least ten pictures each and some have or will have over a hundred pictures. We would be happy to create posts on the dead malls in Illinois and credit you for the pictures. I am currently working on three posts of decent size from Ohio, Kentucky, and Pennsylvania. I did mean to pull this post down a while back, but like I said we do still accept pictures. I am trying to work out a way that makes it possible to send a large number of photos since email only handles a few at a time. former cypress inn in monroe, opening back again?